While we have a thread on what you are listening today, I thought it might be interesting to see what CDs people are getting (new releases, reissues, or perhaps used CDs). Given the so-called "condition" of the CD classical market, I seem to sense people are still buying discs for their collections. No time parameters on acquisitions ... can be today, yesterday, or since the first of the year. If possible, show label name and number for those who might be interested in adding to their own collections. You can be as brief as you wish. Even count downloads! Re: What NEW discs are you adding to your collection? I'll start it off. Picked this one up yesterday. Was poking around Amazon and saw that the notorious reviewer "Santa Fe Listener" had condescendingly trash-talked one disc from the set. At that point I knew I had to have it. (Well, actually I listened to multiple excerpts and liked what I heard. Plus I generally admire Teldec engineering, and audio quality is a drawback on the other Vaughan Williams recordings I have). All for 17 pounds from MDT. my personal highlight would be 'The Music Makers'. Last edited by Jared on Tue Jun 02, 2009 2:55 pm, edited 1 time in total. this one plainly isn't, and I don't take to Brahms when it gambols along with a jolly, up-tempo spring in its step, like its pretending to be a Mendelssohn String Symphony... if you like that kind of thing, then do acquire this CD, but it probably won't be getting to many more listens fro me..
Now you've reminded me how much V-W I already have, Boult/Decca cycle, Haitink cycle, Thompson cycle, most of the Hickox/Chandos, the Barbirolli recordings on EMI. But still the impression that there is more to discover. Non seem to have the audio engineering that would bring out all of the sonorities of this music. I am optimistic about what Teldec manages. What surprises me is that Decca never put together a stereo Vaughan Williams cycle. P.S. to Lance. Maybe you should change your title to "What NEW music..." Some of the youngsters get music from those newfangled download thingamajigs. nut-job wrote: Non seem to have the audio engineering that would bring out all of the sonorities of this music. I am optimistic about what Teldec manages. I see J&R has this on sale for $19.99, at least at the time of this post. Some great opera excerpts by Balfe - Wallace - Benedict, and some Irish songs! She Moved Thro' the Fair; If I Had a-Knew; Trottin' to the Fair; Lovely Jimmy; The Stuttering Lovers. I truly love music from Ireland and England during the time period of the 1800s. Balfe and Wallace were both Irisn and Benedict was British but uses an Irish setting for his work. I thank Joan Sutherland and Richard Bonynge for doing so much to dig up this rarely heard material. These are older (ADD) recordings made in Dublin in September 1967. Singers are so-so but the music is delightful, almost in a Gilbert & Sullivan manner. Hmmm---all are additional recordings of favorite works. Funny that I seem to be getting more out of "new" recommendable performances of such beloved music than I get out of recordings of music that is new to me. Guess that's because most of the musical "backwaters" I've explored in recent years have yielded few if any treasures. On the other hand, I'm getting more out of hearing new music in live performance than I get out of hearing old faves. Guess that means the pendulum has swung again. The title is Sanskrit and means “room of light.” For Unsuk Chin, the title does not have any specific religious or mythological meaning. Instead, it refers in many respects to the character of the work as well as to the composition techniques employed. The composer tells that in Rocaná she was concerned with the behavior of beams of light – their distortion, refraction, reflections, and undulations. This was not a matter of mere illustration, but of their depiction by musical means: “Art as harmony parallel to nature” (Cézanne). Since sound waves – as the physical phenomenon of a bodiless oscillation – are similar to light waves, music seems the appropriate medium for a “translation” of light phenomena. Furthermore, physical phenomena like space depth and space density, spatial perceptions and illusions of various sorts were important associations in the composition process. Ólafur Elíasson’s installations The Weather Project and Notion Motion provided additional extra-musical inspiration. The music in Rocaná flows uninterruptedly. The overall picture and the overall structure are one entity, one “tonal sculpture". However, one can look at it from various angles, since the inner structures are constantly changing. Even if the music at times gives the impression of stasis, subtle impulses, interactions, and reactions are continually present. Certain elements appear time and again, yet always in varied form. They are not developed: they instead lead seamlessly into one another and blend, forming new interactions and processes. Orderly structures suddenly turn into turbulence and vice versa. Pointilistic structures transform into cloudlike aggregates of sound and vice versa. The composer once pointed out that because of her cultural background she has "a certain aversion to the sound world produced by traditional symphony orchestras rooted in 19th-century aesthetics, and I feel a great deal of affinity for non-European musical cultures. That is why I always try to introduce a completely different color into my compositions based on my experience of non-European music." In Rocaná, the instrumentation is more or less standard, but an attempt has been made to treat the orchestra like a "super-instrument" as well as like a virtuoso “illusion machine” that creates something new out of that which is familiar. Primarily through the combination of various instrumental techniques, through rhythmic development and the interplay of overtone structures and microtones, shifts and changes of timbre are achieved; light and color phenomena playfully alternate with one another. Am currently engaged in fighting off the flu, after la bella esposa has been knocked out for a week with same. 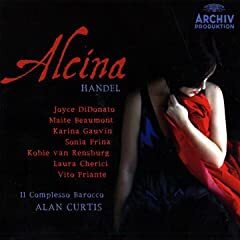 Put on Handel's Alcina w/Joyce DiDonato and, I must confess, am liking this better than either Fleming or Sutherland. DiDonato is truly a knockout, outstanding even among a group of very fine colleagues: she certainly has that star-quality that makes a great singer: effortless, yes truly effortless. A truly outstanding effort, gifted to me by a friend on another forum! Many thanks! Yeah, I advertised Alcina some months ago. Only Chalk listened to me. Sylph wrote: Yeah, I advertised Alcina some months ago. Only Chalk listened to me. Sao Paulo/Neschling works by Francisco Mignone. Great disc, and the OSESP is one of the most underrated orchestras in the world. Check out anything they've done, is astounding playing. Celibidache/Munich Bruckner Symphony. No.4. The only one I don't have. Found it for $2.98 at a used store. Its not my favorite reading, but still great to have for any Bruckner fan. The last one, 22 cds for 45 bucks, new. It's going to be a long, long time before I've made it through that Haydn set. 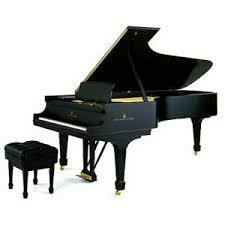 I will post my impressions of the Schumann when I have had a chance to listen. And so would I....as I have come late to the music of Schumann and am very taken with it I am interested to hear peoples' views of different recordings. A number of the songs (Brahms wrote so many!) - again, not my usual cup of tea, but now that I know the background - why written, under what circumstances, to whom dedicated, what hidden meanings are to be found - I am curious to hear some of these. I am afraid that when I get to the end of this beautifully-written bio, I actually will miss Johannes Brahms - this at-times guarded, private, shy, manipulative, witty, cantankerous, gruff, attractive, generous genius - and man. ..... again, not my usual cup of tea, but now that I know the background - why written, under what circumstances, to whom dedicated, what hidden meanings are to be found - I am curious to hear some of these. I like that too....when you read about a work and it is put into a greater context it sometimes takes on an additional dimension, making it that little bit more enjoyable. 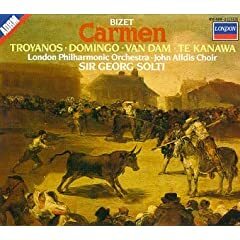 played it once just now, thoroughly enjoyed it... lively, engaging rendition of both works.. I would love to hear what you think of that one when you eventually get around to listening to it. I've had a once-over of two of the three discs. JEG's take on the Spring Symphony is as bouncy as any I've heard (excepting, perhaps, Bernstein), and the period instruments bring a certain edginess to a work that always sounds a bit bloated when played with a modern orchestra. The finale is a whirlwind of colour. 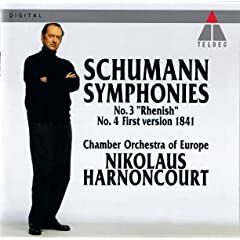 The first disc also includes the two extant movements of Schumann's early 'Zwickau' Symphony (1834); compare this with Dausgaard and the Swedish Chamber Orchestra's recent release that only includes the opening movement. The Gardiner performance also features far greater dynamic contrasts and a much brighter sound than Dausgaard's. 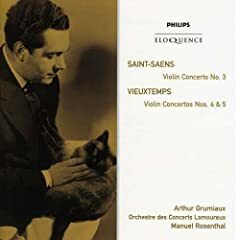 The third disc features the Konzertstück for Four Horns--an especially formidable challenge for the period hornists, and here expertly pulled off. The smaller supporting ensemble does not drown out the soloists; as such I don't feel as though the horns had to project themselves as much as in some modern-forces recordings, which means better overall tone quality. The 'Rhenish' Symphony, my favourite work of the composer's, though, leaves something to be desired. There is nothing particularly objectionable about the performance, but Gardiner doesn't seem to have the same knack for rhythm and syncopation that Dohnanyi or Sawallisch do and that the piece demands. Some of the instrumental nuances also seems to get lost in the ORR's overall framework. Tempi are fairly standard throughout. The revised 1851 version of the D minor Symphony is wonderfully played; Gardiner's approach to the overall narrative is as characterful as any I've heard. I'll give a better review once I've listened to all three discs a couple of times. Thanks for the quick response, Ken. That cycle is definitely one that I want to buy. I appreciate the summary; one's initial reactions are often the most interesting. Oh, but how can a serious collector like you not have Haitink's reading, too? I bet it's because it has Poulenc's Gloria. You don't like the French. It's a SACD, too. Is that the CSO recording with Kathleen Battle? Awesome performance. One of my earliest CD purchases. Thanks for that review of Swafford's biography of Brahms. I'll be sure to get it. His general guide to classical music is quite readable and enjoyable. I've been getting new "old" recordings lately. The EMI best Of series is great: Elizabeth Schwarzkoff; Victoria De Los Angeles, Barbara Hendricks, and Morella Freni - each of these is fantastic. Also: Brendel's Schubert Box set from years ago, and hi Box set of the Beethoven Concertos. I am currently working on getting more Mutter recordings. And I am continuing a larger project to get ost of the rest of the von Karajan Legacy DVD series.